Attend a Deposition From Anywhere! Use any device to connect. Connect your laptop, cell phone, or tablet to traditional videoconference rooms. Prioritize audio for clean record of testimony. For something as important as a deposition, rely on mobile videoconferencing tailor made for the legal industry, ensuring smooth proceedings. We offer two state-of-the art videoconferencing suites at our office near downtown Phoenix, featuring full 1080p High Definition for a crisp, vibrant picture. 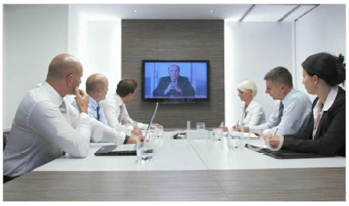 We can use our network to find videoconferencing suites in any city or town, or connect to a witness or attorney’s computer or iPad if they can’t or won’t travel to a videoconferencing suite. by videoconference from our conveniently-located office.